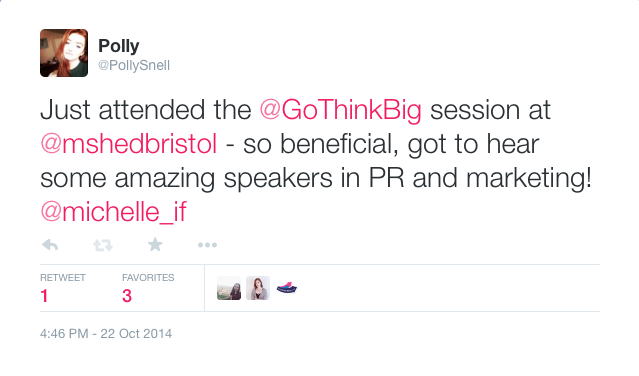 Today I spent my day off attending the Go Think Big networking session at The Mshed in Bristol. I’m so glad I went, there were some really interesting speakers and I always leave things like that feeling motivated and fresh with new ideas of how to start applying for placements and other types of work experience. I made some notes during the talks that I thought would be useful to document on my blog, so I can refer back to them easily in the future. – It’s Go Think Big’s 2nd birthday tomorrow! What qualities do you (each of the speakers) value most? – Enthusiasm, research, give reasons why you want to move on from previous positions, important to have a strong handshake, appear professional and ready to work, know everything you possibly can about the position you’re applying for, preparation is key! – Attention to detail – do NOT have spelling mistakes on your CV! – Know your strengths, and be ready to explain these articulately. Freelance – always looking for your next job. Something important not to forget! Always keep networking, and remember the reputation you’re creating as you go. Keep aware of this. Be an ambassador for yourself! Also, when you freelance you have to have a serious think about what your daily/hourly rate it. Don’t undersell yourself! Look at how other professionals in a similar position to you market themselves. In PR: Show initiative. Do extra when possible. Say yes to things! E.g. organise client lunches. You often get promoted to Manager when you’re good at seemingly unrelated skills. Admit when you need help. Put yourself out there – and put yourself forward! – Prep. Give examples of previous campaigns for the organisation you’re applying for. – Show you actually know what PR is! You’d be surprised how many people don’t do this, or do this badly. – Show a willingness to get stuck in. – Do more than you’ve been asked. – In emails, be formal until given the impression/tone you can start to be more casual. Again, have respect and don’t be cocky. – Respect yourselves in what you present, e.g. check links work and basic things like this! – Check your cover letters. No use applying to Channel 4 with “It’s always been my dream to work for the BBC…” Shocking, but people have done this! – Runner. Good for entry level! You get access to all aspects of production. – Make sure you present what you care about, give potential employers a feel of what you’re actually all about. People want to work with people they like! – Don’t be afraid to apply for lots of different roles. Don’t feel restricted or tied down to one particular type of role based on what degree you have chosen. – PR: don’t have to have a degree. Experience sometimes can shine over this! – Go to multiple events in PR! This can be as valuable, and remember to network. – Raw talent is important. E.g. working in film, make a different new practice film every weekend. Make your hobby your life. Go to events and even festivals. So important! Volunteer at these events to avoid the expense. Collect business cards. Leave these events with at least 3 new contacts. How to start from nothing: MIND MAP! Tip from Emma Hart, Head of PR at O2 – Make a mind map of literally every single person you know. Circle the ones you think may be able to help you, by recommending you to a company or providing you with some experience, and then circle the people you spend a lot of time with. They often overlap! Go to PR conferences. Make follow ups, collect email addresses and even send your CV over in emails to these people. You never know what they might be looking for that your skills suit. Look for jobs that are advertised. With Linked In, some don’t like you to connect until you’re a graduate. Keep your personal online profile and professional online profile separate as far as possible. Find people you get on with really well, perhaps senior to you, and help them when you find it within your power to. These relationships can really benefit in the long run! And it makes any job more enjoyable which is crucial. Show an interest, ask to be put forward for things. Say yes to absolutely everything. You never know what could happen. Working hard now in your 20s can make massive steps in your career. Get your name out there! Whether this means writing a blog showcasing your work, posting videos or other creative projects on social networking sites, entering competitions in your field etc. Do some things for free if possible, but set yourself time limits. Don’t be taken for a ride but don’t be too defensive. If it’s going to help you, don’t turn your nose up! Think of other ways to earn something back from unpaid work experience, e.g. ask to be endorsed for a skill by someone senior in the company, or ask for a recommendation to make new connections. Keep thinking about how to progress. Ask for 15 minutes of someone’s time, not an hour for coffee! GoThinkBig.co.uk – advertises a lot of interesting work placements so have a look on here! If the job you’re applying for hasn’t been advertised, make it clear you have a passion and this job interests you greatly. If you’ve got ideas e.g. if a company could do their social media better, email and suggest it! You can create jobs for yourselves.